James Abbott McNeill Whistler was born in Lowell, Massachusetts, on July 10, 1834, the son of Major George Whistler, a railroad engineer, and Anna McNeill. In 1842 Czar Nicholas I (1796–1855) of Russia invited Major Whistler to build a railroad from St. Petersburg to Moscow and offered the princely salary of twelve thousand dollars a year. In St. Petersburg the family lived luxuriously, with several servants, and James and his brother had a governess and a Swedish tutor. Because French was the court language, the boys soon became fluent in it. On one occasion the Whistlers took a trip fifteen miles out of St. Petersburg to Tsarkoe Selo. Here, in the palace built by Catherine the Great (1729–1896), there was a suite of apartments in the Chinese style containing many fine examples of Oriental porcelain. James was fascinated by this collection and later became a collector of blue-and-white porcelain. during the years in Russia, and in 1845 he was enrolled in a drawing course at the Academy of Fine Arts in St. Petersburg. In 1849 Major Whistler died, and Mrs. Whistler returned to the United States with her sons, settling in Pomfret, Connecticut. James decided he wanted to go to the U.S. Military Academy at West Point, which his father had attended, and obtained an appointment in 1851. At West Point he stood first in the drawing course but did poorly in chemistry. Because he constantly broke the rules, he racked up two hundred eighteen demerits (marks for bad conduct) and as a result was dismissed in 1854. After an unsuccessful apprenticeship (a job acquired to learn a trade) with the Winaas Locomotive Works in Baltimore, Maryland, Whistler obtained a job in Washington, D.C., with the Coast and Geodetic Survey. He was always late, often absent, and was the despair of his employer. However, he had the finest training in etching (the process of producing a design or a picture off a hard surface with the use of chemicals) and learned the basic principles of printmaking. With a three hundred fifty dollar-a-year inheritance from his father, Whistler went abroad to study art. He arrived in Paris, France, in 1855 and at once threw himself into the artistic life of the French students. While copying in the Parisian art museum the Louvre in 1858, Whistler met Henri Fantin-Latour (1836–1904), who in turn introduced him to Alphonse Legros (1837–1911) and other artists, including the great realist painter Gustave Courbet (1819–1877). In 1858 Whistler brought out Twelve Etchings from Nature, known as the French Set. The next year his first important painting, At the Piano, influenced by Fantin-Latour and Dutch seventeenth-century interiors, was rejected by the Paris Salon (an art gallery), although it was accepted by the Royal Academy in London, England, in 1860. Whistler's painting Wapping (1861) shows the influence of Courbet's realism, an art style that seeks to capture reality. One of the figures in the foreground is the redheaded Irish beauty Joanna Hiffernan, known as Jo, who became both Whistler's model and mistress. He painted her as The White Girl (1862), standing in a white dress, against a white background, with her red hair over her shoulder. The figure is medieval (having to do with the Middle Ages) in feeling with a remoteness and deep-thinking gaze that place it close to the Pre-Raphaelite painters, a band of painters that reacted against the unimaginative and traditional historical paintings of their time. Whistler knew their work; he had met Dante Gabriel Rossetti (1828–1882) in 1862 and was decidedly influenced by the Pre-Raphaelites at this time. Although The White Girl was rejected by the Royal Academy in 1862 and the Paris Salon of 1863, it was a sensation at the Salon des Refusés, admired by artists though laughed at by the public. In 1863 Whistler leased a house in the Chelsea section of London, where he set up housekeeping with Jo. His mother arrived late that year and spent the rest of her life in England. Whistler became a collector of blue-and-white porcelain as well as Oriental costumes, in which he posed his models for such pictures as La Princess du pays de la porcelaine (1864). In 1871 Whistler published the sixteen etchings, Views of the Thames, known as the Thames Set. He also did a series of atmospheric paintings which he called nocturnes. He liked to go out on the river at twilight and was fascinated by the foggy or misty effects in the fading light. In putting these impressions on canvas from memory, he made use of the Japanese concept of space as a well-balanced design in which perspective plays no part. In the famous Arrangement in Grey and Black, the Artist's Mother (1872) he composed the picture with disarming simplicity, keeping the Japanese concept of space in mind. During 1877 Whistler exhibited several paintings, including Falling Rocket, a nocturne showing the mysterious and elusive (hard to grasp) effects of fireworks at night at Cremorne Gardens. It outraged John Ruskin (1819–1900), considered the country's finest judge of good taste in England, and he wrote an insulting review of the exhibition. Whistler sued him for libel (a written statement that hurts someone's public image) in what was the most sensational art trial of the century and was awarded very little money. The trial ruined Whistler financially, and he had to sell his new house and sell off his porcelain collection. Fortunately, the Fine Arts Society commissioned Whistler to do twelve etchings of Venice, Italy. He spent fourteen months in Venice doing many etchings as well as small oils, watercolors, and pastels. His etching style was now completely changed. He treated his themes with the utmost delicacy, using a spidery line and lively curves, and he often wiped the plates to give tone. His Venetian work sold well and he was financially reestablished. He took a house in London with Maud Franklin, who had replaced Jo as model and mistress. On the evening of January 31, 1885, Whistler delivered at Prince's Hall the "Ten O'Clock," his famous lecture summing up his theories on the nature of beauty in polished prose. He mentioned the poetry that evening mists produce when "the tall chimneys become campanili and the warehouses are palaces at night." One of Whistler's finest achievements was in the field of lithography (the process of printing on metal), which he concentrated on for a ten-year period beginning in 1887. Drawing in the most spirited way, he used a stump as well as a pencil and obtained effects never achieved by a lithographer before him. He had great ability with watercolors and small oils which sometimes depicted the seaside or shop fronts in Chelsea. In portraiture he favored full-length standing poses, influenced by Diego Velàzquez (1465–1524), and was more concerned with subtle tones and atmosphere than he was with exact likenesses. In 1888 Whistler married E. W. Godwin's widow, Beatrix. The Whistlers moved to Paris in 1893 but two years later were back in England. Trixie, as his wife was called, died of cancer in 1896. After her death, Whistler maintained studios in both Paris and London. He died in London on July 17, 1903. Anderson, Ronald K., and Anne Koval James McNeill Whistler: Beyond the Myth. New York: Carroll & Graf, 1995. Berman, Avis. James McNeill Whistler. New York: H. N. Abrams, 1993. 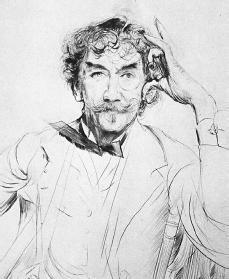 Fleming, Gordon H. James Abbott McNeill Whistler: A Life. New York: St. Martin's Press, 1991. Whistler, James M. The Gentle Art of Making Enemies. New York: John W. Lovell Company, 1890. Reprint, New York: Dover Publications, 1967. Wharton, Edith White, E. B.